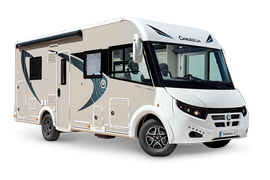 CHAUSSON is a leading brand of motorhomes manufactured in France. As you can well imagine, motorhomes and gastronomy have always been symbols of enjoyment for us. 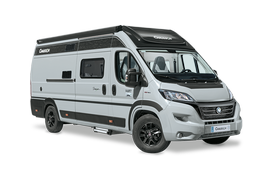 Look in each month on “”Bon Appétit with CHAUSSON”” and learn how you can cook in a CHAUSSON motorhome by discovering French cuisine that’s simple, easy to prepare, authentic and tasty. We’ve looked for recipes that are easy to make without an oven, featuring easy-to-find ingredients from French and most European markets. Chef Alexandre Lecomte will guide you in creating mouth-watering dishes, with or without a motorhome! ► Slice the bananas in two. ► Squeeze the lime juice. ► Remove the mint leaves from their stem. ► Melt the butter and add the bananas on the fleshy side. ► Add the spices and raisins. ► Add the brown sugar. ► Turn the bananas and add the lime juice. ► Crumble the speculoos cookies.  Our “creole” bananas can be enjoyed with a Clairette de Die to add some sparkle to this dessert. ► Slice all fruits and vegetables except the lemon. ► Cut the carrots into thin strips. ► Separate the cauliflower flowerets. ► Pour the olive oil into a preheated wok. ► First brown the onions, and then the vegetables. ► At the end of cooking, add the cherry tomatoes and apples. ► Salt, pepper and at the end of cooking. ► Add the coriander and pink peppercorns. ► Finally, add the lemon juice to heighten taste. ► Your wok-fried meal is ready to enjoy.  To accompany the vegetables, I suggest a white Saint Joseph, a well-known Rhône Valley wine made from Roussanne and Marsanne grapes. ► Dissolve the cubes to make a bouillon. ► Pour in the olive oil. ► Add the rice slowly so that it takes on a sheen and becomes transparent. ► Add the white wine. ► When the white wine has evaporated, add a first ladle full of chicken broth. ► Repeat three times until all the water has been absorbed. ► In a hot pan with oil, fry the salmon steaks on the skin side. ► When the rice has absorbed all the bouillon, add the mascarpone. ► Add the herbs at the end, along with the Parmesan shavings. ► Our risotto with fresh herbs and salmon is ready.  We’ll serve it with Saint Peray, a white wine from the Rhône Valley made using Marsanne and Roussane grapes. Duck breast with sautéed parsleyed potatoes . ► Fry the duck breasts on the skin side in a hot pan, without added oil. ► Fry well on the skin side, letting the duck fat accumulate. ► Wash the potatoes without peeling them. ► For the parsleyed potatoes: Start by peeling the garlic. Chop the top of the parsley bunch. Add the garlic cloves. ► After about five minutes, stir. ► We use the duck fat to brown the potatoes. then add the curly parsley and the duck breasts to warm them.  For a wine to accompany our dish, I suggest a red Saint Joseph wine, a Syrah variety grown in the Ardèche region. Veal sauté à la provençale. ► Peel and chop the red onions. ► Separate the garlic cloves, keeping their skin. ► Add the meat and salt and pepper it. ► Add the garlic cloves. ► Dice the zucchini and eggplant. ► Mix in the onions. ► Add the tomato concentrate. ► Lightly flour the meat to thicken the sauce. ► Deglaze with the white wine. ► When the white wine has boiled down, add the water. ► Halfway through cooking time (20/25 min), add the vegetables and let simmer for 20 min. ► Five minutes before cooking is finished, add the cherry tomatoes and black olives. ► Stir well and cook for five more minutes. ► Your veal sauté à la provençale is ready to eat.  We suggest a Crozes-Hermitage made with Syrah grapes, a very good wine from the Rhône Valley.